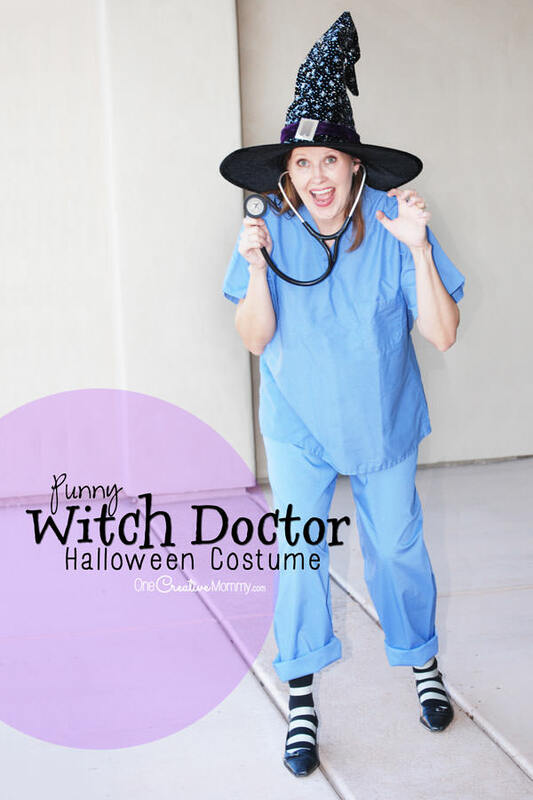 You are here: Home / Blog / Check out this easy and cheap last minute Halloween costume idea! Check out this easy and cheap last minute Halloween costume idea! Since I’ve been a bit under the weather, I forgot all about inviting friends to participate in Spooktastic September! My favorite holiday, and I forgot! I’ll do my best to bring you my own spooktastic ideas this month, starting with this easy, last minute Halloween costume idea. 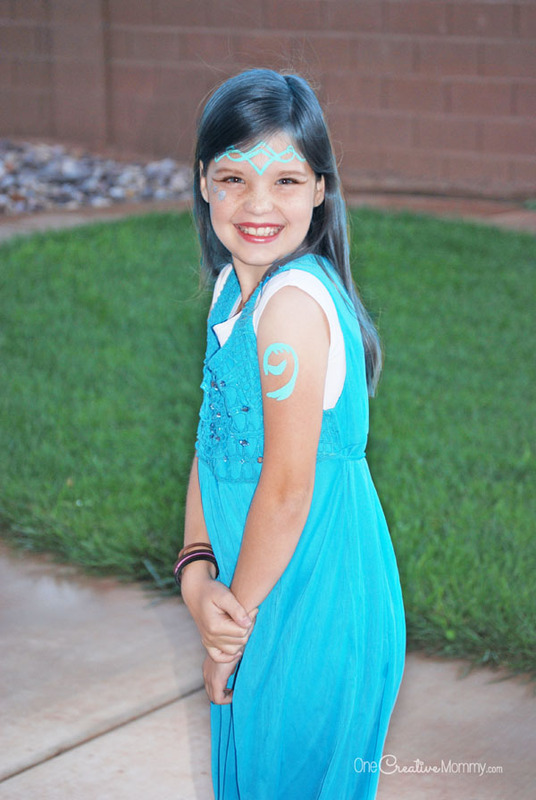 If your kids love Lego Elves like mine do, they’ll love this easy costume! 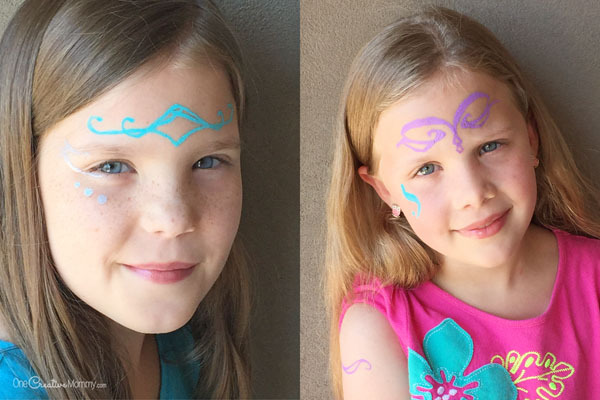 This costume idea started one lazy summer day when my bored girls decided they wanted to look like their favorite Lego Elves characters. Here they are — Naida the Water Elf, and Aira the Wind Elf. Let me give you a warning. Beware when you paint your kids’ faces. All of the sudden they look all grown up! To create the look, I pulled out my tiniest paintbrush and my acrylic paints. We pulled up the Legos on the computer so that I could see the symbols nice and big, and then I painted on their faces and arms. The girls had a blast being Lego Elves for a day. Little did I know that this idea would come in very handy a few months later when I was sick the week of Halloween! All month, Boo had planned to dress as Mal from Descendants. I figured we could quickly pull something together. I waited until the last minute. All the cheap costumes were gone, and there was no way I could make something. It wouldn’t be as easy as I thought. And, I was sick. Lightbulb!!! The Lego Elves idea would be perfect! The only hard thing would be to create some sort of dress. 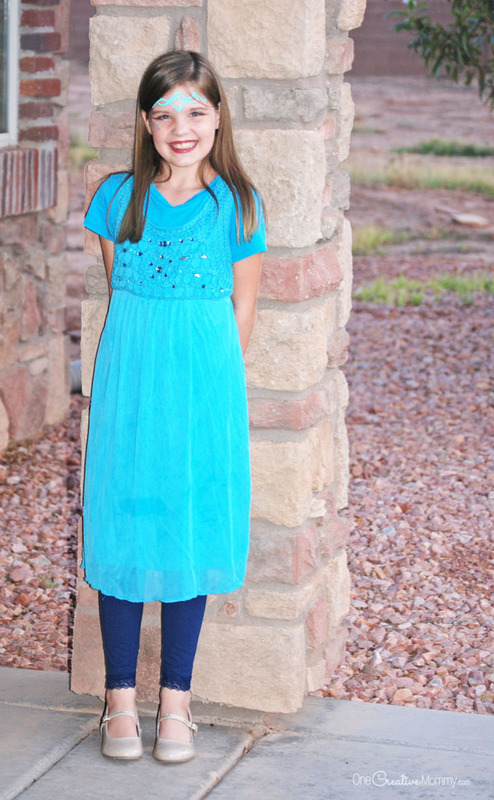 We set off for our local DI (Utah’s version of Good Will) with the hopes to find some shirts to turn into a dress (like we did with my Easiest Indian Costume ever). We found this simple dress for a couple of bucks, and it was the perfect color. No sewing–just lots of smiles from Mom and daughter!! So, all you need for this costume is acrylic paint and brush, colored hairspray (optional), and a simple dress from Good Will. If you have the time, add a braid to the hair, too. Easy peasy! Okay, admit it. You can tell. The blue hair in our Lego Elves costume was added via Photoshop. We did spray Boo’s hair blue at one point, but her hair is so dark that it just didn’t show. If you have a blond child, it will probably work best for you. 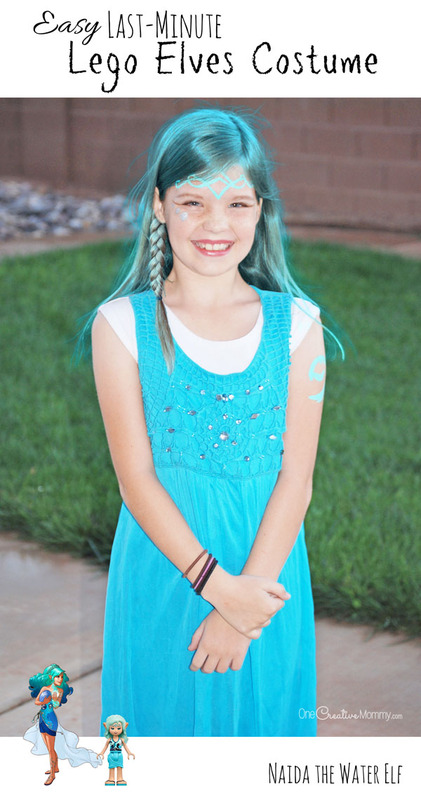 Blue hair or no, this last minute Halloween costume is still a hit! 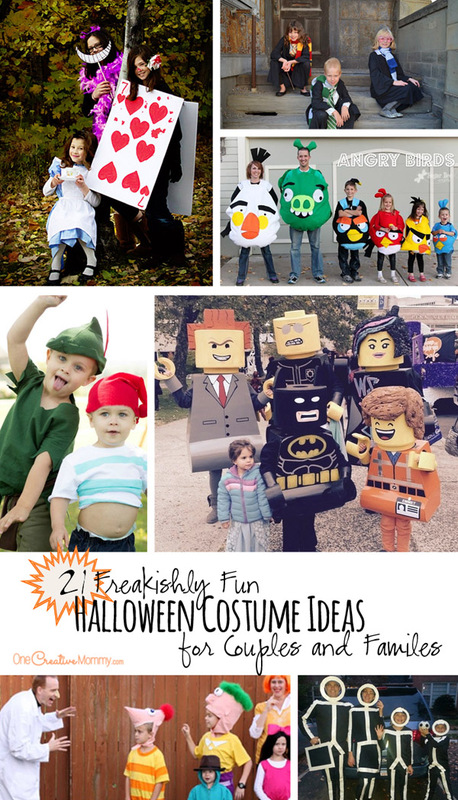 Need some more costume ideas? Check these out! Click on the images below to visit the posts. Thanks for stopping by! The elves and some of your other costumes shown are great suggestions. I was just asking my youngest earlier what he wanted to dress as. Thanks, Val. I love and dread hearing what my girls want to dress as each year. Sometimes the costumes are easy, and sometimes they’re quite a stretch! There are plenty of occasions where parents scramble to find a last minute costume, so I can see this simple DIY really coming in handy. I plan to share that witch doctor idea with my physician friend as well. Thanks, Marcie. That witch doctor costume is my go-to costume every year. It’s just so easy! Hey Heidi this is a very creative costumes ! Looking great and very cheap to make them. Wonderful ideas. Thank you ! I love this post. Very helpful. I especially love the Peter Pan hat. 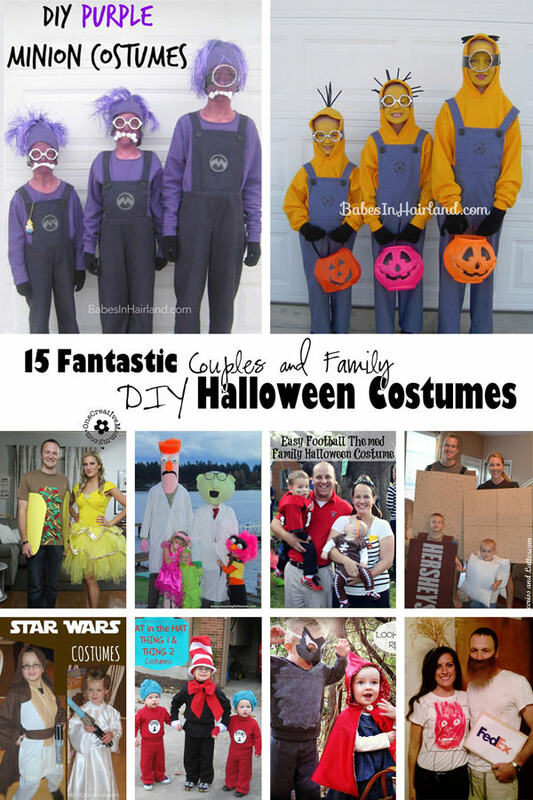 You don’t need to buy an expensive costume to be able to make easy and fun costumes.